For a complete list of scheduled lens tours, see our events page. A lens tour is a real treat, but they are scheduled only 8 days a year. Are you coming to the Lighthouse? Consider staying overnight at the Light Station. See our rental units. Some units are pet friendly. This State Historic Park occupies a spectacular headland extending out into the Pacific. There is a parking area inside the gate off Point Cabrillo Drive, adjacent to the restored Kearn farmhouse. Enjoy the half mile downhill walk to the Light Station buildings. Note: there is parking for disabled persons in front of and behind the 1st Assistant Lightkeeper’s House (the first residence) at the bottom of the hill. There are two paths to the Station. The dirt path begins at the north end of the parking lot and takes you through the introduced grassland and coastal prairie. The paved access road to the south is an easier walk. Please use established trails and keep dogs leashed and under control at all times. The main floor of the Lighthouse, the 1st Assistant Lightkeeper’s House and the Marine Science Exhibit are open to the public from 11am to 4pm year-round. The State Historic Park is open from sunrise to sunset daily. The main floor of the Lighthouse is dog-friendly. Find us on the Mendocino coast. 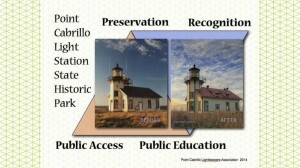 Learn about the colorful history of the light and the surrounding area. See the various opportunities of overnight accommodations on site.